Custom sunglasses are a fun bulk giveaway at weddings and outdoor events. We’re here to help you find the styles your recipients will actually wear. Branded sunglasses are a great way to make an impression. However, some advertisers make the mistake of choosing the wrong kind for their audience. Yes, it is true that any type of promotional item will still gain impressions, but you want to go all-in and choose an item that your clients will actually wear. Don’t just choose cost when selecting custom logo sunglasses. Yes, everyone has a budget, but chances are we have a great style that falls within any budget. When you pick a style that someone enjoys, they will wear them more often and give you more impressions. This results in a larger return on investment and maybe even more customers. So, you want clients to wear your sunglasses. How do you do that? The first thing you need to keep in mind is usefulness. People retain promotional products based on their usefulness. With UV protection being a needed item all year long, custom logo sunglasses are clearly an item that your clients will use. For clients who receive your branded sunglasses who don’t want them, they will likely pass them on to someone who will. In fact, very few people discard gifts such as custom printed sunglasses. In fact, they are only discarded approximately 23 percent of the time. Compare this to how many flyers or magazine advertisements are discarded (as well as targeted spam email that is deleted), there is no comparison. Now that you know promotional glasses are useful, think about style. Different people have different styles and choosing the right one can lead to more clients actually wearing your custom logo sunglasses. People like to be stylish so having the right style will increase the likelihood they will be worn. Choose a style based on your actual clientele. For instance, if you are in a professional industry like real estate, you may want to select a pair of sunglasses that can be worn with professional clothing. Car dealerships need to select something that is stylish while driving such as Malibu-style promotional glasses. Just know, don’t select children’s plastic glasses to give out to professionals and vice versa. As with all our promotional items, you can always give us a call and we can walk you through the styles that will best fit your industry. With that in mind, here are five of the most popular custom printed sunglasses that your clients will actually wear. Aviator sunglasses are a style of sunglasses originally developed by Bausch & Lomb in 1930s for use by pilots. They were sometimes referred to as pilot’s glasses and were popularized in the 1980s with Tom Cruise wearing them as the lead actor in the movie Top Gun. They have come a long way since the 1930s and were even worn by Michael Jackson during many of his concerts. Aviators have become somewhat of a status symbol in America. Over the years, they have expanded to have both men and women styles along with different lens colors. People love these glasses and are seen wearing them in all sorts of professions as well as just wearing them out and about. You can choose these sunglasses in a variety of different frame colors including black, gold, or silver. They allow for the imprinting of your logo on the lower part of the lens. Or, choose a set of Fly’n Aviator Sunglasses where you can customize one of the many color variations of glasses stems. Regardless of the style you decide to choose, your clients will always enjoy Aviators custom printed sunglasses. They will feel like part of a fashion icon as they showcase your brand. Another popular style of custom sunglasses is Malibu. These are the sunglasses you typically see for all around use. You can find them at the beach, while driving, worn with casual or formal clothing, and at just about any event you will every participate in. They have the look of the Ray Ban Wayfarer from the 1950s and have also become somewhat of an American cultural icon. Malibu sunglasses are the perfect branded sunglasses as they come in so many different colors. They are made of polycarbonate material and have UV400 lens protection. Your clients will wear them as they are so versatile and go with anything. If your clients are gamers, then go with Malibu Gaming Glasses which are made specifically to help protect your eyes from screen glare. Just keep in mind that going with Malibu is likely to fill your needs with just about any client. According to GQ, the 1990s are making a resurgence and wraparound sunglasses are going to take over this summer. The 1990s saw this type of eyewear completely take over the industry with everyone from movie stars to athletes wearing them. The sports industry dominated the use of wraparound shades with Oakley being the largest manufacturer. In fact, the wraparound shades are what helped launch Oakley’s brand into one of the most popular sunglasses brands today. While sports used to dominate, the wraparound sunglasses have become more and more popular in mainstream. The popularity of these glasses is what people love. Your clients will wear them not because they are athletes, but because they are in fashion. Even Yeezy has developed his own style of wraparound sunglasses. Retro and vintage sunglasses are always in style. The only question is, what style? Every few years we see a resurgence in older style sunglasses, so it is just a matter of finding out what is hot. One retro style currently in the spotlight is the Lennon Round Sunglasses made famous by the Beatles’ John Lennon. These stylish round frames were popularized in the 1960s and 70s and are making a huge comeback. Even Maximum Magazine featured them as one of six essential sunglasses for this Spring. This style, also known as teashades, aren’t great at covering up the sun, but people wear them for the fashion. Another style is the Fiesta Sunglasses. These frames have nose pads and are the typical Hollywood style sunglasses you find actors and actresses wearing when driving around town or at the beach. They are reminiscent of the style worn by many famous people including Marilyn Monroe. Retro branded sunglasses can change often so it is always good to check around to find out what is making a comeback. As always, you can reach out to us for advice on what is stylish. We can provide you with a few different styles to choose from that fits your brand and your budget. Yes, outside of style and usefulness, there is always room for the funny, wacky, and unusual custom logo sunglasses. Why? Well, people like to laugh, be different, and have a good time. That’s why you should never rule out the purchase of these type of custom printed sunglasses. Some of the most common wacky branded sunglasses really aren’t that wacky. They are simply regular sunglasses with bold designs. An example is Chillin’ Zebra Sunglasses which are more of a Malibu style with zebra designs (in various colors of course). Dominator promotional glasses are also well received by clients as they are stylish yet unusual in the fact they have the logo or design printed on the larger portion of the lenses. You could also go with a pair of visor sunglasses. These custom logo sunglasses contain a visor attached to help keep the sun from creeping in from the top of the glasses. Another option would be pixel sunglasses which have a fun shape all in themselves. As sunglasses are such a useful item, your clients will surely wear any pair you give them. 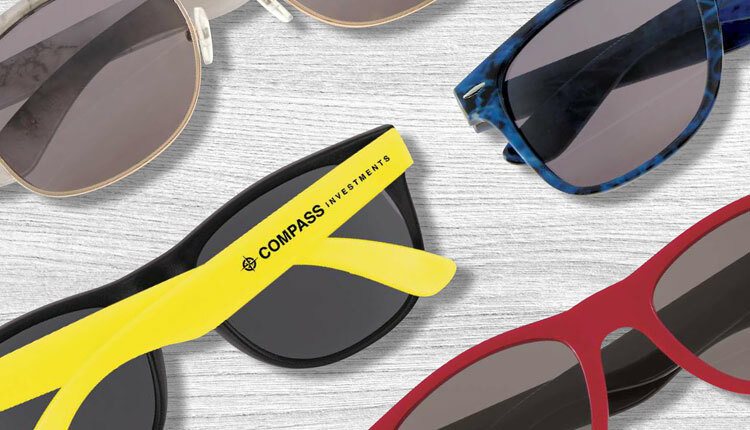 Maximize your brand impressions by choosing the right custom logo sunglasses so that they will likely wear them regularly. Keep in mind that clients may even pass them on to others if they don’t want to wear them. Styles change constantly. As such, it is important to keep up with fashion trends and choose the promotional glasses that are in style. Doing so is likely to help create a positive impression with your clients. If you are unsure of the style to choose or have a specific budget you are working with, give us a call to discuss. We can always customize your order to get the best return on your investment with custom printed sunglasses.